Dematic Real Time Logistics has won Kmart’s Supplier of the Year award for Project Innovation. 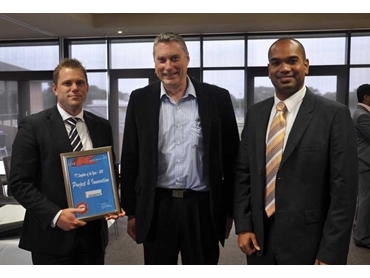 The award recognises Dematic’s contribution to the success of Kmart’s new DCs around Australia and New Zealand. The prestigious award was presented to Dematic’s General Manager - Real Time Logistics, Nathan Taylor by David Keil, Kmart’s General Manager - Information Technology, at Kmart’s IT Supplier Update. It was won jointly with Core Solutions. The Project Innovation award was won for the design and rollout of RF and mobility equipment, and for Dematic’s work on Kmart’s new sorter systems.